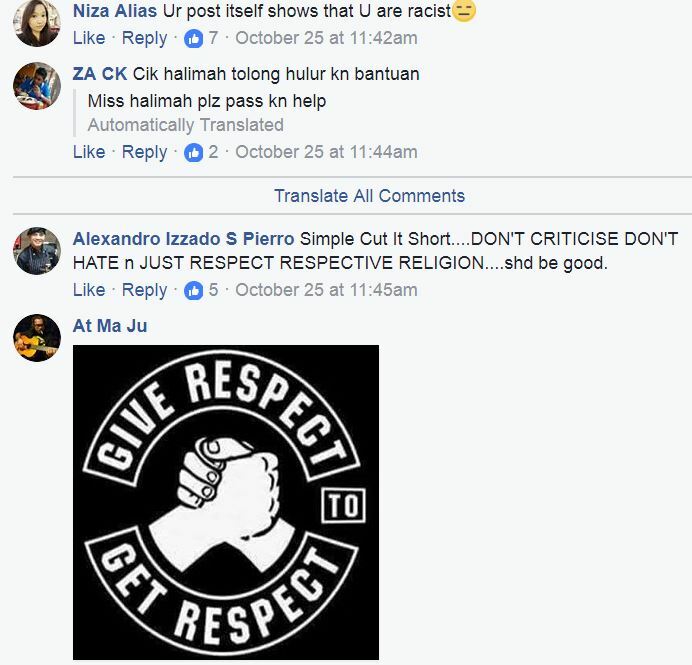 When twin sisters Syahidah and Hirah Rostam posted about an incident where they were allegedly prohibited from using a stairwell at Alexandra Central Mall by a “racist” security guard working there, they received widespread criticism instead of support mostly from members of their own Malay and Muslim community. I was asked to stop praying at the staircase by a security guard who was told by his supervisor over the walkie talkie…. 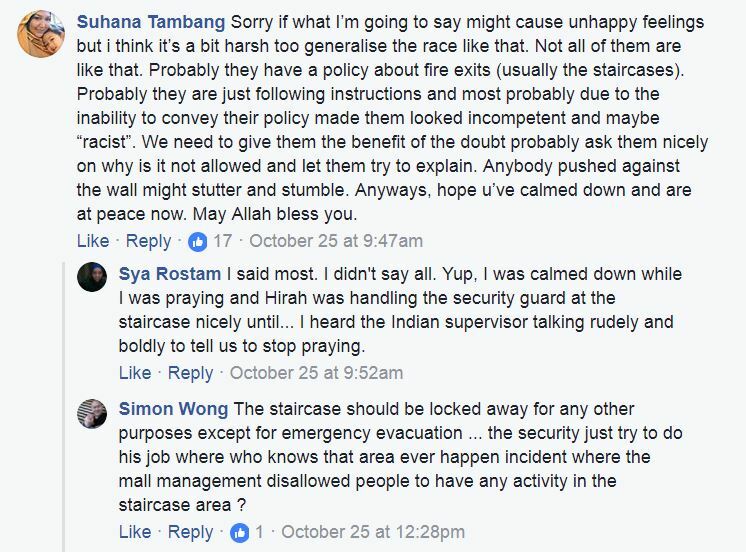 I was asked to stop praying at the staircase by a security guard who was told by his supervisor over the walkie talkie. 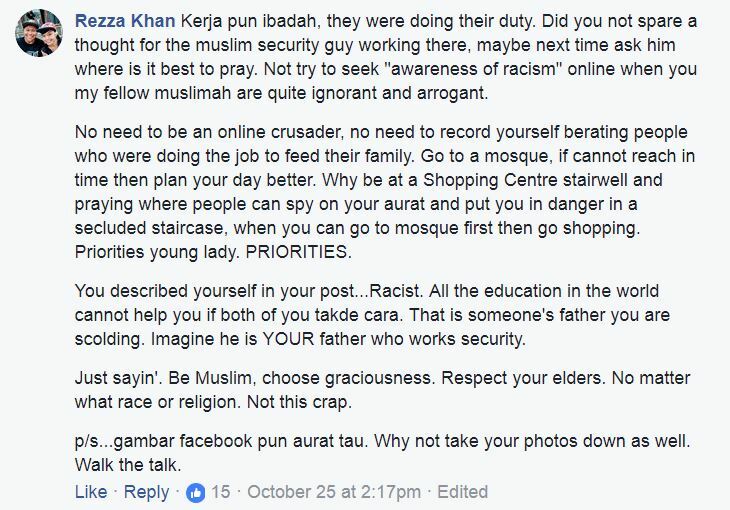 Apparently, the supervisor is an Indian security guard who shows his superiority towards me who was praying silently at the staircase. 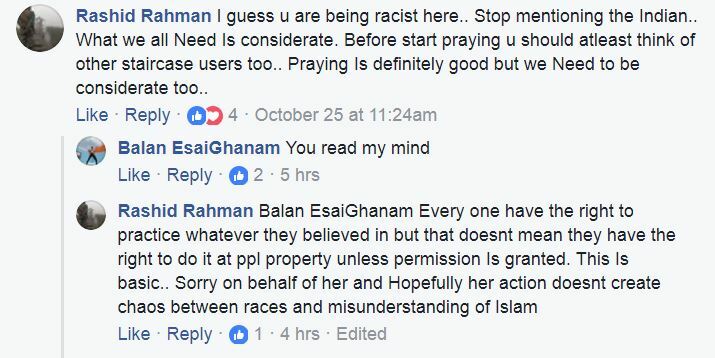 Just a prayer mat on the floor & he wanted to make a big issue about it. Pray 5 mins become dramatic 15 mins. 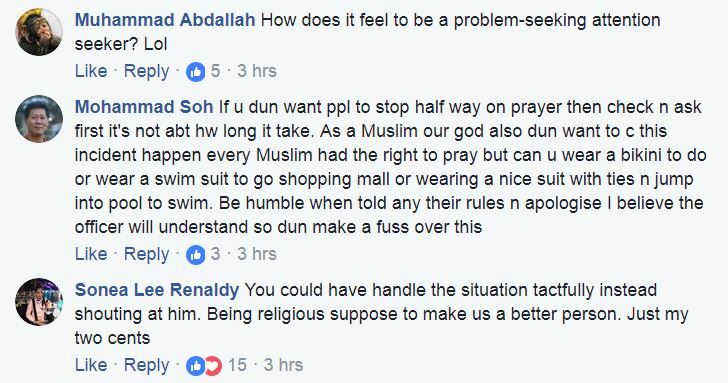 In @hirah_rostam and my 29 years of life living in S’pore, we have always been doing prayers at any staircase in shopping malls or hospitals be it public or private ones. 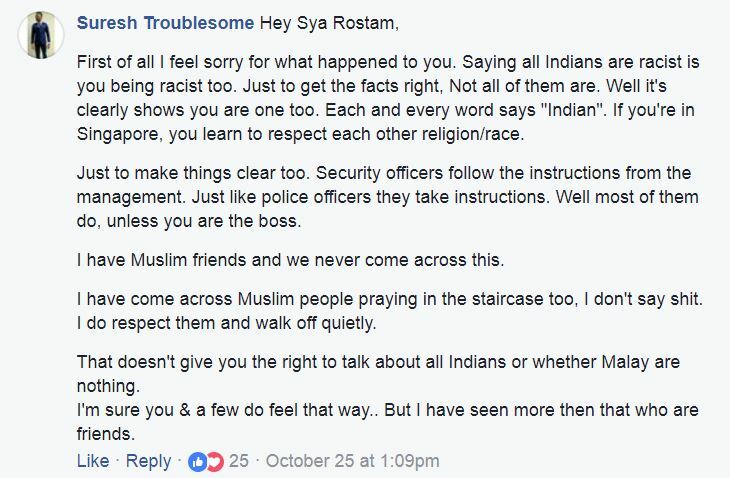 Security guards who have seen us (non-Indians) before are always okay with us praying there. Some of them even willingly showed us where we can pray. 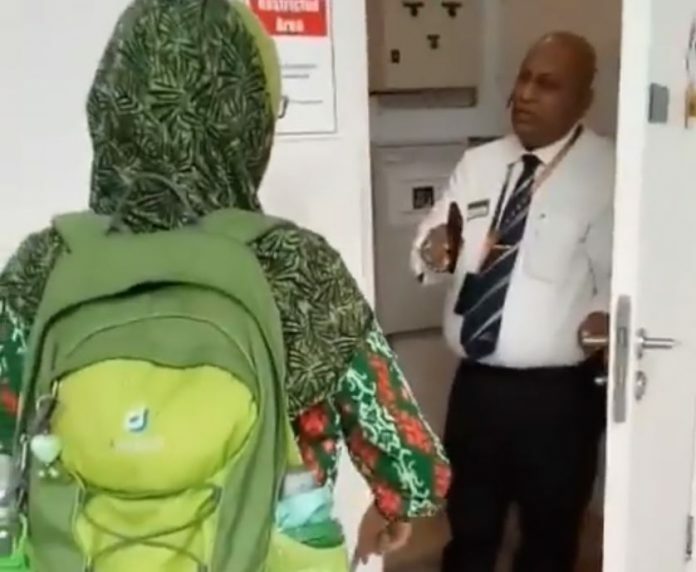 But this Indian security guard didn’t even say sorry to me when he told his staff to stop me from praying. I already started praying for God’s sake! Talk like world over the walkie talkie but when we asked him to meet us at the staircase, he didn’t come up. When we came down to see him, he didn’t want to come out. ***There is no black & white signs or evidences that Muslims cannot pray at staircase. It is not a crime. 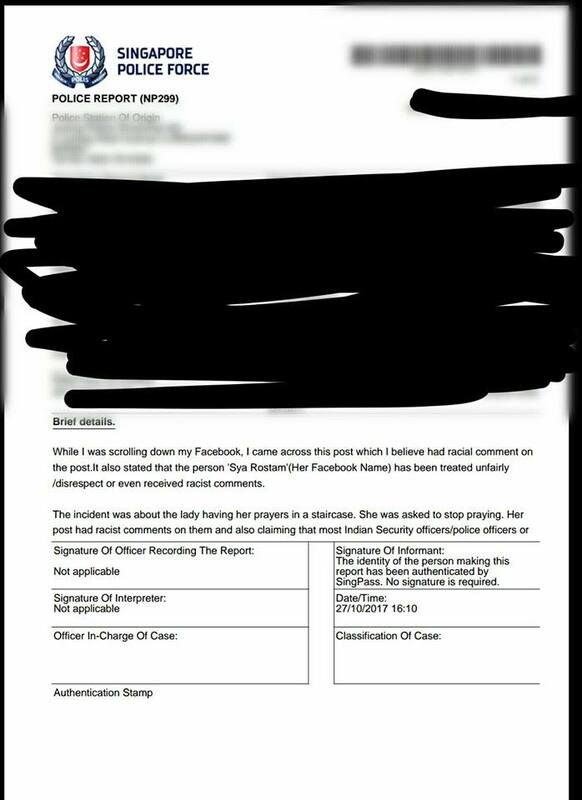 If it is, this will be a police case. 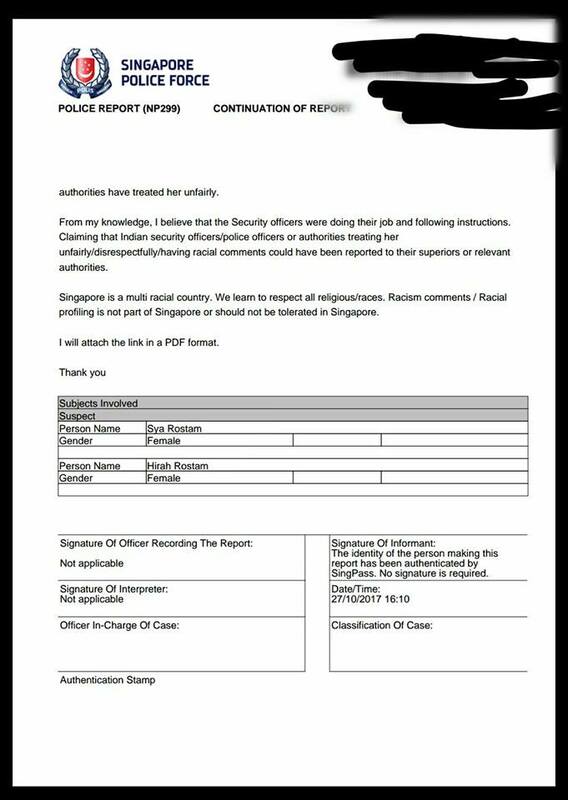 The other 2 staff under him are Chinese & Malay. They kept saying sorry. 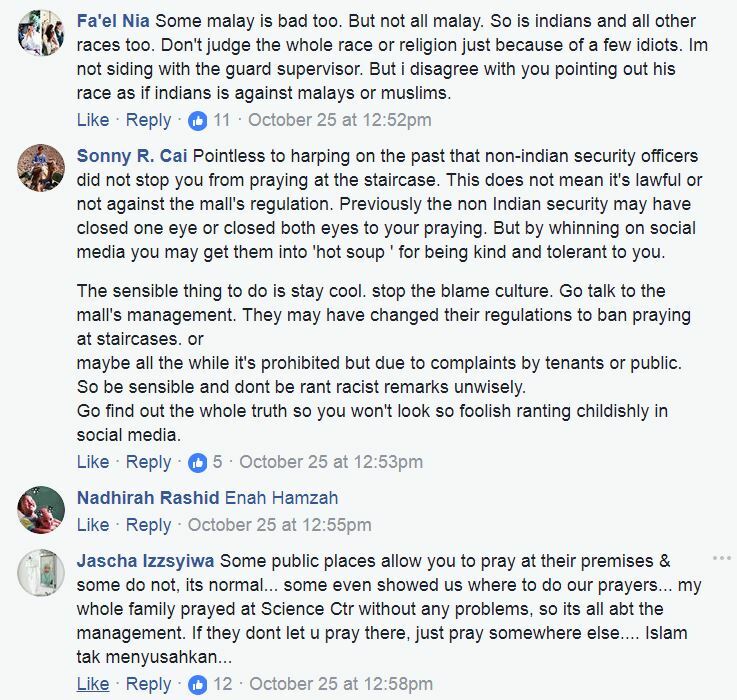 Everytime Hirah & I encountered with police, security guards or authorities, they are always Indians who look down on us Malays or Muslims. 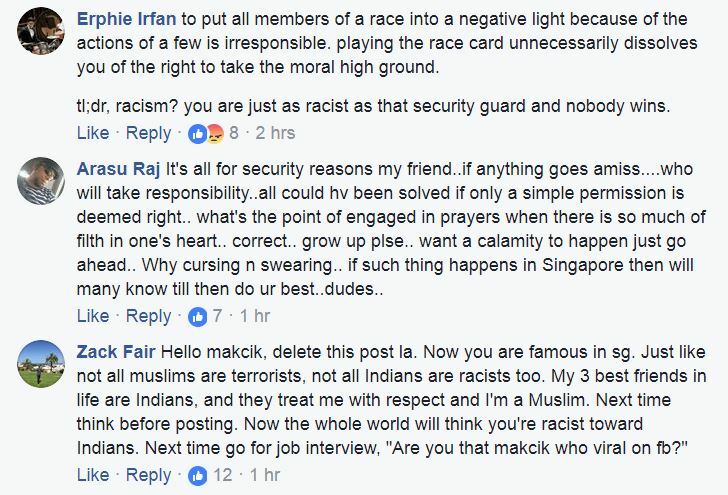 Like the Indian security guard who rudely approached Hirah & her freestyle soccer friend (Azri) at Tamp Hub recently. 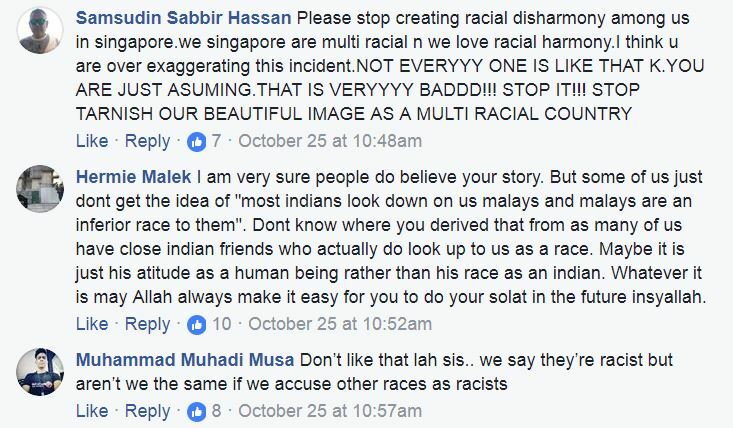 I am aware most Indians look down on us Malays & Malays are an inferior race to them. They are capable of teaching & influencing people close to them to be superior or unapologetic about mistakes done. 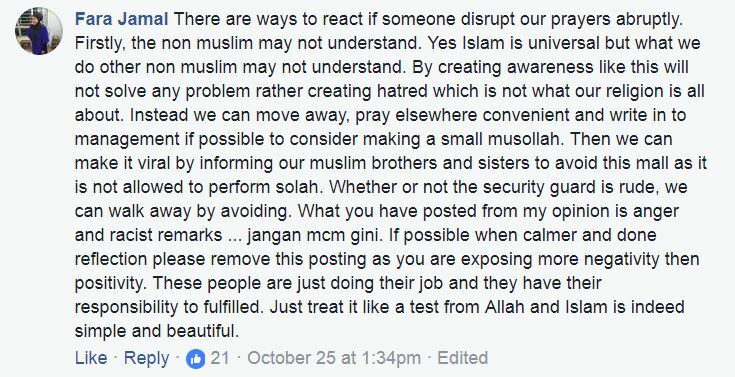 This is what I feel everytime Indian security guards, police & authorities speak to us Malays. 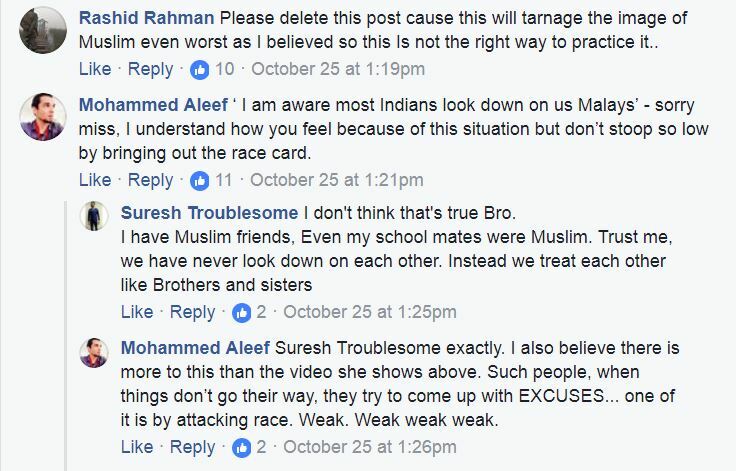 Or when Indians who are not close to me or extended friends who are Indians treat me. 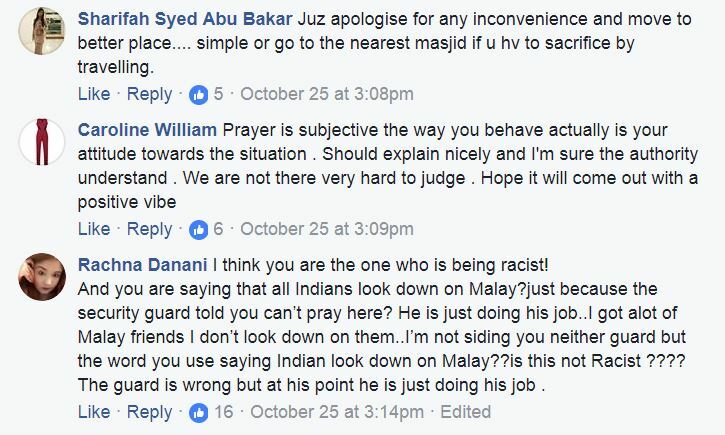 Like we Malays are nothing and they are superior as ever.